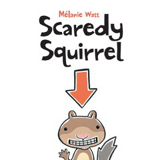 WARNING: Scaredy Squirrel insists that everyone wash their hands with antibacterial soap before reading this book. What's more, Scaredy Squirrel is fully equipped with an emergency kit and an escape plan. I was completely charmed by Scaredy Squirrel. This delightful picture book is a fun way to discuss dealing with fears -- but mostly it's a lot of silly fun.